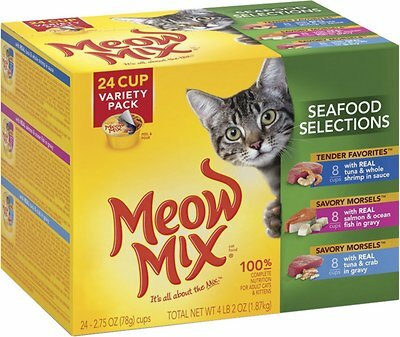 Your cat can dine on a different delicacy every night with Meow Mix Seafood Selections Variety Pack Canned Cat Food. 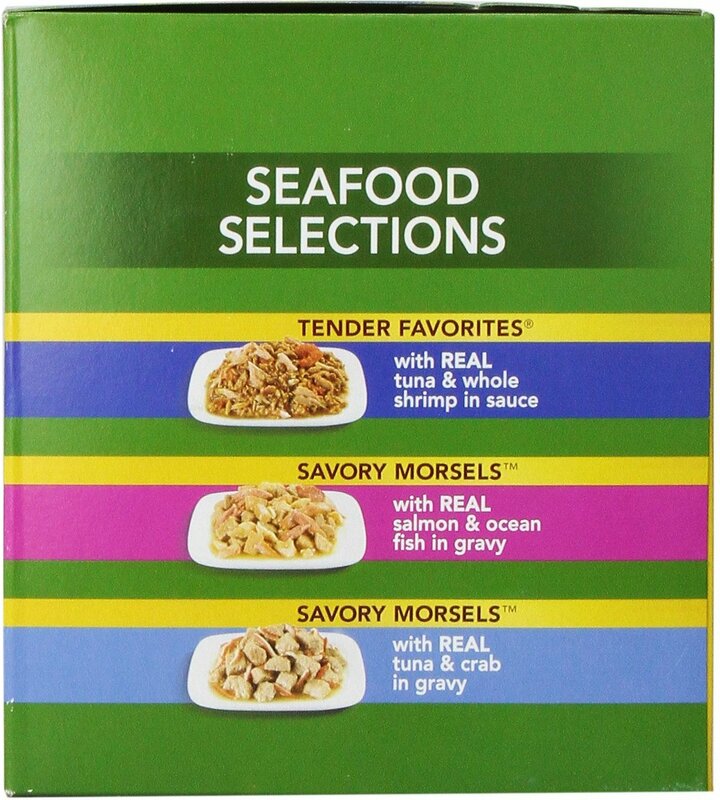 This variety pack features 24 cups of these favorite seafood feasts: Tender Favorites with Real Tuna & Whole Shrimp in Sauce (8 cups), Savory Morsels with Real Salmon & Ocean Fish in Gravy (8 cups), Savory Morsels with Real Tuna & Crab in Gravy (8 cups). 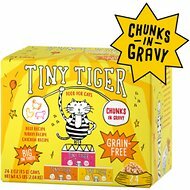 Open up a cup and treat your favorite feline to tender pieces of real tuna, salmon, whole shrimp, ocean fish and crab in a savory sauce. Meow Mix meals are made with wholesome ingredients and are so tasty, cats ask for them by name. Savory Morsels with Real Salmon & Ocean Fish In Gravy: Fish Broth, Fish, Chicken, Wheat Gluten, Food Starch, Salmon, Ocean Fish, Tuna, Sugar, Chicken Liver, Dried Egg Product, Guar Gum, Salt, Calcium Sulfate, Tricalcium Phosphate, Sodium Tripolyphosphate, Titanium Dioxide (Color), Natural & Artificial Flavors, Potassium Chloride, Vitamins, [Vitamin E Supplement, Niacin, Thiamine Mononitrate, Vitamin A Supplement, Pantothenic Acid, Riboflavin Supplement, Pyridoxine Hydrochloride (Vitamin B6), Biotin, Vitamin D3 Supplement, Vitamin B12 Supplement, Folic Acid, Menadione Sodium Bisulfite Complex (Source of Vitamin K Activity)], Minerals (Ferrous Sulphate Monohydrate, Zinc Oxide, Manganese Sulfate Monohydrate, Copper Proteinate, Sodium Selenite, Potassium Iodide), Canthaxanthin (Color), Carrageenan, Choline Chloride, Beta Carotene (Color), Magnesium Oxide, Sodium Nitrite (To Promote Color Retention), Red 3. Savory Morsels with Real Tuna & Crab In Gravy: Fish Broth, Chicken, Tuna, Wheat Gluten, Modified Tapioca Starch, Chicken Liver, Imitation Crab (Water, Whitefish, Wheat Starch, Potato Starch, Soy Protein Isolate, Palm Oil, Salt, Sugar, Dried Egg Product, Paprika, Carmine (Color), Crab, Sugar, Natural and Artificial Flavors, Dried Egg Product, Salt, Tricalcium Phosphate, Calcium Sulfate, Sodium Tripolyphosphate, Titanium Dioxide (Color), Guar Gum, Potassium Chloride, Vitamins [Vitamin E Supplement, Niacin, Thiamine Mononitrate, Vitamin A Supplement, Pantothenic Acid, Riboflavin Supplement, Pyridoxine Hydrochloride (Vitamin B6), Biotin, Vitamin D3 Supplement, Vitamin B12 Supplement, Folic Acid, Menadione Sodium Bisulfite Complex (Source of Vitamin K Activity)], Minerals (Ferrous Sulphate Monohydrate, Zinc Oxide, Manganese Sulfate Monohydrate, Copper Proteinate, Sodium Selenite, Potassium Iodide), Choline Chloride, Taurine, Carrageenan, Magnesium Oxide, Sodium Nitrite (To Promote Color Retention). Tender Favorites with Real Tuna & Whole Shrimp In Sauce: Tuna, Fish Broth, Ocean Fish, Shrimp, Soybean Oil, Natural & Artificial Flavors, Tricalcium Phosphate, Guar Gum, Carrageenan, Salt, Calcium Sulphate, Vitamins [Vitamin E, Niacin, Thiamine Mononitrate, Vitamin A, Pantothenic Acid, Riboflavin, Pyridoxine Hydrochloride, Biotin, Vitamin D3, Vitamin B12, Folic Acid, Menadione Sodium Bisulfite Complex (Source of Vitamin K)], Minerals (Ferrous Sulphate Monohydrate, Zinc Oxide, Manganese Sulphate Monohydrate, Copper Proteinate, Sodium Selenite, Potassium Iodide), Sodium Nitrite, Color. We keep dry food out all day, but when we eat, the cats know they are getting Meow mix. They come running and sit by their dishes because they know they are getting the good stuff. And of course, you can't beat the Chewy prices!!! Super Selection for Finicky Felines! Pin bones. The tuna and shrimp have pin bones galore. The other flavors are alright, but I won't be purchasing the fish box again. I will stick with the chicken and beef. 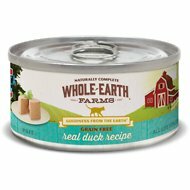 This is the only wet food my cat will eat. She only likes seafood. This is a very convenient way to always have her favorite on hand without a panicked rush to the grocery. Only 1 cat likes any of these although they look appetizing. I keep finding bones in them - big ones, too, like you find in trout or salmon, so unsure why the manufacturing process can’t catch them. After the 4th container with a bone, I threw them all out. The food was delivered today and my cat seemed to really love it. Unfortunately, the food comes in plastic, non-recyclable, containers. I will not be purchasing this food again. Miss Priss is VERY particular about her food. Drives me up a wall! 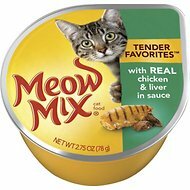 Well, I tried the seafood selections Meow Mix and she virtually licks the platter clean. SO happy!!!!! My cats are picky and I finally found something they like.